Tyylikkäät Home 1 Acre - 5 minuuttia Hissit! Pääkerroksessa on makuuhuone noin 12x10 ja queen bed suoraan vastapäätä kylpyhuonetta. Yläkerran makuuhuoneessa on suuri 21X14 jalka parvi. On tarpeeksi nukkumassa yläkerran makuuhuoneessa 5 henkilöä - kaksi erillistä vuodetta. Yksi koko sänky. Yksi queen-vuode: avoin makuuasunto. Kaikki yhden hengen vuodetta ovat korkeat / hyvä laatu ja lähes uusi. Tämä miellyttävä koti sijaitsee neljä kilometriä etelään "Breckenridge". Sijaitsee metsäinen joen ympäristössä yhden hehtaarin, "hiihto" on oikeassa ulos etuovesta jokirannalla alas stream yksi kilometriä yksityinen järvi. Kaikki yksityistä omaisuutta. Kesällä pyörätietä alkaa vain muutaman sadan metrin päässä kotoa ja mahdollistaa pyöräily Breckenridge, "Copper Mountain" ja "Vail". Koti on yksityisomistuksessa ja hallinnoi omistaja. Koti on erittäin siistejä ja hyvin toimitettu. Niille vilkkaampi vieraille ostoksia ja toimittaa elintarvikkeita voidaan tehdä etukäteen pientä maksua. Jos etsit arvoa ja majoitus, jotka saavat sinut pois vaivatta tärkeimmistä keinona tämä on paikka sinulle. "Ei Lemmikkieläimet" sallittu ja "tupakointi kielletty" sallittu odota. Wonderful clean family cabin near Brekenridge! My wife and I visit Brek each year with another couple to ski. This year we used homeaway to book our trip and found this cabin. I don't believe that the pictures do this cabin justice. The family that owns this cabin has done a wonderful job stocking and caring for it. The living areas of the cabin seem much larger in person than in the pictures and the property is absolutely beautiful. The owner did a wonderful job answering any questions we had prior to our trip and after we arrived he gave us a call to make sure that we were settling in ok. This cabin would be perfect for families or couples going skiing or exploring the area. It is only 5 minutes from town and the ski lifts and provides a great atmosphere for entertaining. During our time there we visited Brekenridge, Keystone, and Arapahoe Basin. Brekenridge is a short 5 minute trip and Keystone and Arapahoe were both within 30 minutes. We loved the cabin so much that we spent most of our nights cooking dinner, playing games, and having a drink or two. The only thing that this cabin does not have is washer/dryer and a television. (During our trip we hung our gloves/clothes above the wood stove and it dried them out very quickly.) We would highly recommend visiting Brekenridge, Mi Casa restaurant and Eric's pizza. Smile on our face. 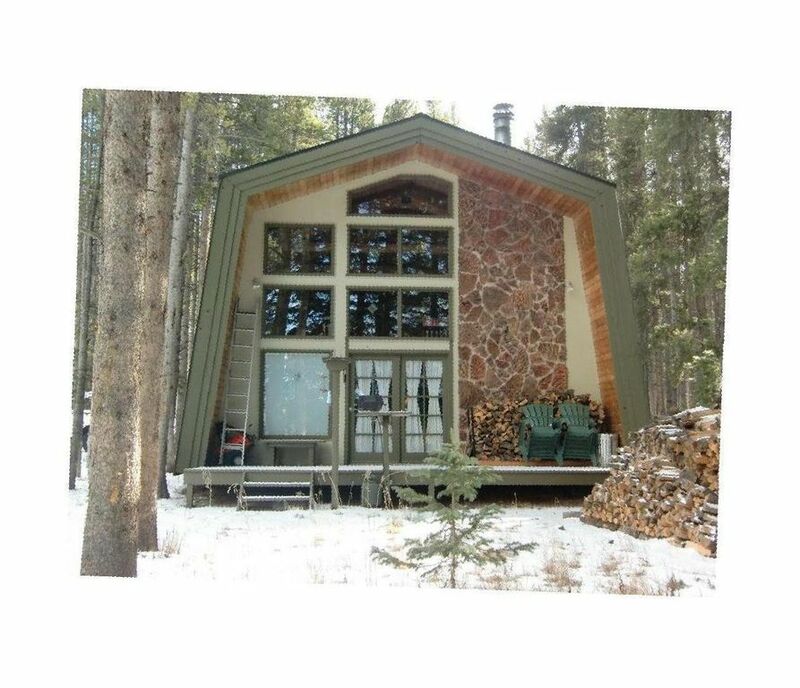 The property is beautiful and 5 minutes away from downtown Breckenridge. From pots and pans to spices it's well furnished. Beds are super comfortable! I'll return next year with pleasure! My husband and I were skeptical of this cabin because there were no online reviews, and it has been listed for quite some time. Ironically, once we booked the cabin and were settled in there, I read two guest books full of wonderful reviews of this place! The cabin is on a beautiful setting close to the slopes. We stayed during a big cold spell in the winter, and the cabin was quite warm. We were able to use the wood from the huge woodpile on the property to build a fire in the wood burning stove at night, once my toddler was sleeping. On a side note, it might be helpful to bring a portable baby gate if you are traveling with a little one, so you can block them from accessing the stairs to the loft. Also, although we brought our own, a practically new pack n' play was provided at the cabin. The kitchen is very well stocked with all the cookware you would need including a pantry of some staples if you should get snowed in. There are also a variety of board games, books, magazines, and a stereo to keep you entertained. Although at the time of writing this review, the listing shows that there is cable tv and wireless internet, there is NONE! But, if you are looking for a relaxing get away, you won't miss it. Lastly, you can tell that the owners of this cabin take great pride in their property. They also provided us with a detailed list of tips and info in regards to this cabin and were prompt to communicate with us. So if you are looking for a charming place to stay, I highly recommend this cabin. Hope to be returning there again soon!